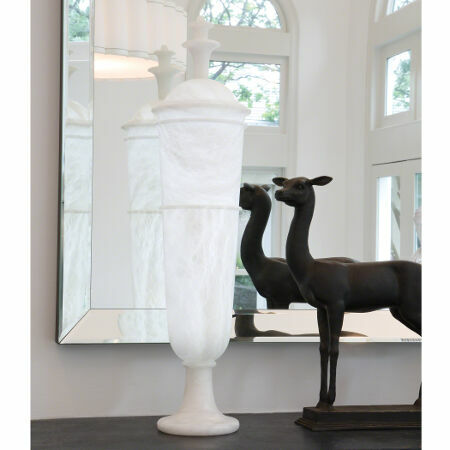 Tall, sleek and luminous, this urn makes a mysterious connection to the silhouettes of ancient Cycladic alabaster vases, as if one had been reimagined or added to by a Venetian in the Byzantine Era or a Roman during the Renaissance. When lit, the depth and nuances of the ancient alabaster comes to life. The interior lighting mechanism is an LED strip light. 7 3/4″ diameter, 32″ high. 8′ clear silver cord, hi/low switch on cord.